generating signals with audio or instrumentation DAQ hardware's. Cross-platform Win XP/7/8 (32/64)/Linux (32/64) freeware. Light and ergonomic. For education, industry and research purposes. With iodaq you can immediately monitor, generate and record signals from most common DAQ hardware's. No license, no registration, no restrictions. After download and installation of the iodaq runtime and software, iodaq should automatically detect and list the available adaptors and hardware’s on your machine, for direct use. Manage your I/O signals the way you want using the settings panel. Save and load your workspaces. Work with multiple screens. Name your signals. Tile your plots in almost any manner. And some more functional, simple and ergonomic features. iodaq could be especially useful for ex. if you’re limited with Audacity®, Adobe Audition® (or similar software’s) for direct multichannel recording, for acquiring DC signals with industrial or instrumental hardware’s, and also if you encounter some incompatibilities issues with Win7. 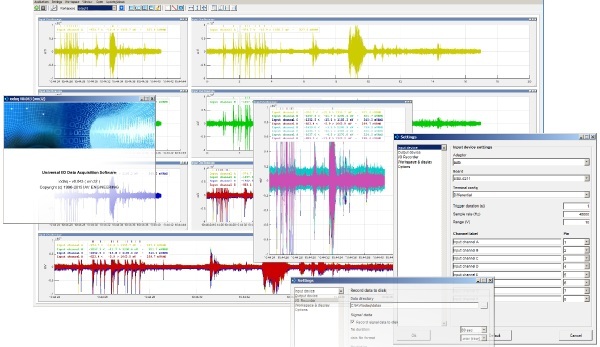 Originally developed for our own acoustics and vibration signal processing need, we now open iodaq to free access so that user’s can benefit their DAQ hardware’s without programming or using more extended software’s. New and missing functions are introduced regularly according to our possibilities. iodaq is developed by IAV Engineering SARL and iodaq® is a trademark IAV Engineering SARL.